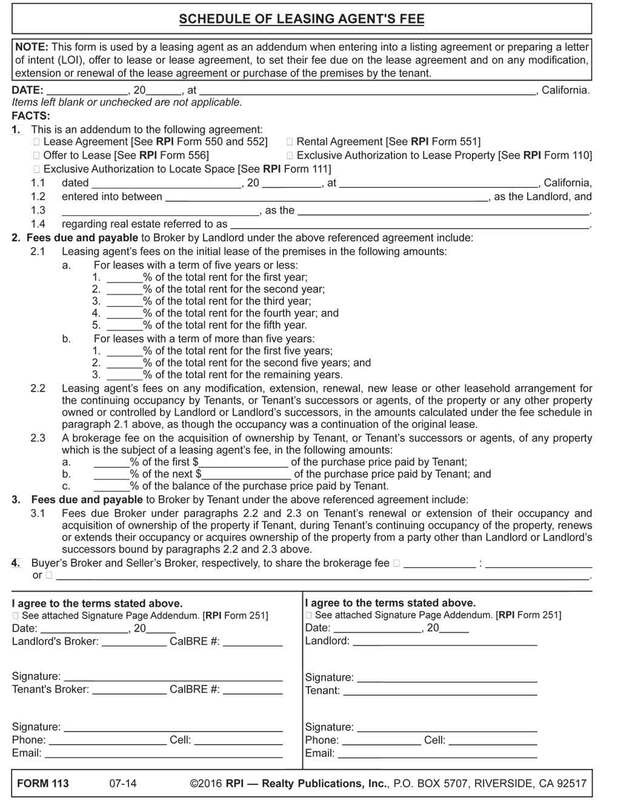 This form is used by a leasing agent as an addendum when entering into a listing agreement or preparing a letter of intent (LOI), offer to lease or lease agreement, to set their fee due on the lease agreement and on any modification, extension or renewal of the lease agreement or purchase of the premises by the tenant. Consider a commercial property offered for lease by the owner. A broker makes an appointment with the owner to discuss the possibility of employment as their leasing agent. negotiating a lease agreement for their occupancy of the space. any other terms accepted by the owner. Occasionally, owners are reluctant to relinquish their possibility to independently and separately lease the property and avoid paying a brokerage fee. However, this avoidance is not available under an exclusive listing to lease. Yet an owner’s best overall opportunity for finding a tenant on acceptable terms is realized when they employ a skilled leasing agent who is well known in the community of local leasing agents. vast exposure to prospective tenants and their agents. Consider an owner whose preference is to agree orally to employ a broker to bring them tenants interested in their property. The owner tells the broker they will work exclusively with them as their leasing agent to market the space and locate a user. The owner does not however believe it necessary to commit all these personal discussions to a written agreement. The broker explains an exclusive authorization to lease needs to be written and signed by the owner for the broker to be entitled to collect a fee for their time, talent and efforts. No signed writing, no services. The fee schedule is attached to the exclusive authorization. It sets out the leasing situations which on occurrence trigger your right to be paid a fee as earned. Consider a broker who, as part of their efforts to locate a tenant under an exclusive authorization to lease, places a “For Lease” sign on the premises. The sign is seen by a prospective tenant. The prospective tenant researches and contacts the owner of the premises directly. Before the exclusive authorization to lease period expires, the prospective tenant and owner enter into a lease agreement. The terms of the lease agreement are different from those specified in the broker’s exclusive authorization to lease. An early termination clause protects you from loss of time, money and talent spent in a diligent effort to locate a tenant when the owner’s conduct effectively removes the property from the rental market before the listing period expires. When the owner interferes with the objective of your employment — to produce a ready, willing and able tenant on the terms stated — a fee has been earned and is immediately due. Consider a broker and owner who enter into an exclusive authorization to lease that expires in six months, the listing period. The agreement contains a fee provision with an early-termination clause. The broker diligently attempts to locate a tenant for the owner’s property. During the listing period, the owner notifies the broker the property is no longer for lease. The broker is instructed to stop marketing the property. In compliance with the owner’s instructions, the broker takes the property off the market. As a consequence, the broker makes a demand on the owner for a full listing fee. The broker claims the early termination clause provides for payment of the broker’s fee by the owner as earned when the owner withdraws the property from the rental market without legal justification before the listing period expires. The owner claims the broker cannot collect a fee under the early termination clause since it constitutes an unenforceable penalty provision. Is the broker entitled to a fee on the client’s termination of the broker’s employment? the negotiations result in a lease agreement. On expiration of the listing period, the broker supplies the owner with the names of prospective tenants they have contacted and who received information regarding the property. Thus, each of these prospective tenants is made known to the owner. After the listing expires, the owner employs a second broker under an exclusive listing without advising them about the terms of the prior listing. Within the safety period of the first broker’s listing, the second broker leases the premises to a tenant registered with the owner by the first broker. The lease is arranged without the first broker’s participation. Is the first broker entitled to be paid a fee on the transaction? Yes! The owner owes the first broker the entire amount of the agreed-to fee under the safety clause provision in the first broker’s exclusive listing — even though the property was leased while listed exclusively with another broker. making special fee arrangements with a second leasing agent which re-ignite negotiations with a prospective tenant located and exposed to the property by the first leasing agent broker. Editor’s note — For more on enforcement of a safety clause in an expired listing, see the February 2015 article Demand for broker’s fee earned under the safety clause. On expiration of the original lease, the owner and tenant negotiate a new lease for the tenant’s continuing occupancy and use of the premises. A brokerage fee is not paid for the tenant’s continued occupancy. The broker makes a demand on the owner for an additional fee under the original listing agreement. The broker claims the new lease, which the broker did not negotiate, earned the broker a fee. The owner claims they do not owe the broker a fee since the new lease is a separate agreement, not an extension, renewal or modification of the original lease. However, the broker is due an additional fee from the owner as agreed in the original listing since the new lease constitutes an extension of the original possession.